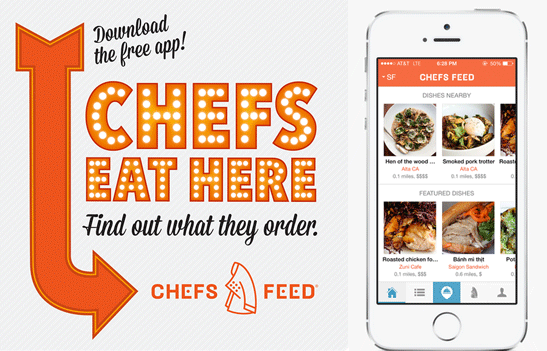 Chef’s feed app | Everything Delicious. Choosing the first subject for this blog is a bit like choosing what to eat in a restaurant. It’s hard because you want to try everything on the menu but realistically you can only eat one dish and you want to choose the right one. So to make sure I picked the right subject for my first entry, I just decided to start by sharing a little foodie insider tip, something that I believe everyone can appreciate. My tip is to share the latest food app I’ve downloaded and really fell in love with. It’s called Chef’s Feed and it’s a modern-day restaurant review app, powered by chefs. If you are like me, you are probably tired of the usual review sites where reviewers’ opinions are so contradictory that you really don’t have a clue whether the place is good or not until you try it yourself. What’s great with this app is that you don’t have to read 100 reviews to compare what people think, you simply trust a chef to tell you what’s good. And after a little while, you will probably know which chef’s you are most alike and can decide to follow only his or her recommendation. Basically, chef’s from around the world join in and share reviews about where they eat and most importantly what they eat, revealing best kept secrets of restaurants in their cities. I personally love it, I find it really provides valuable information and I appreciate that chefs will review high-end restaurants as much as simple and cheap neighbourhood diners… The app is really easy to use. You can follow chefs, check restaurant reviews or dishes reviews near you, look for restaurants by type of food you are in the mood for etc. I have used the app only in Toronto (where about 19 chefs contribute to reviews) and Montreal (currently with 14 chefs reviewing) but the app is available in 24 cities. So have a look and give it a try! To find out more, check out their website or download the app. This entry was posted on August 31, 2014 by Pauline Rosen in News feed and tagged app, chef, restaurant reviews.